Why Does My Catalytic Converter Need Replaced? The catalytic converter is the single-most important piece of emissions equipment on a modern vehicle (except, perhaps, for the engine computer that controls combustion). Catalytic converters turn toxic CO (carbon monoxide) and NOx (nitrous oxides) into relatively harmless carbon dioxide and water. The amazing thing about catalytic converters is that they have no moving parts – they use ceramic honeycombs coated in precious metals to “cook” the exhaust gases and get rid of almost all the pollutants. Even though they have no moving parts, catalytic converters often require replacement. The question is, with no moving parts, why is it that a catalytic converter would ever need to be replaced? 1. Rust. Rust is the enemy of every exhaust system component – especially in humid climates near the Ocean. Catalytic converters usually rust from the outside in, and even with frequent under-carriage washes a catalytic converter will eventually rust enough to become damaged. Rust is inevitable, and if your vehicle is more than 8 years old and/or you live in a rust-prone climate, you might need to replace your catalytic converter. 2. An engine that runs “rich.” When an engine isn’t getting quite enough fuel, it’s said to be running “lean.” When an engine is getting more fuel than it can use, it’s running “rich.” When an engine runs rich, there’s a significant amount of un-burnt fuel in the exhaust gas. This un-burnt fuel isn’t just dumped into the atmosphere, however – it’s burned up inside the catalytic converter. As you can imagine, burning off extra fuel in the catalytic converter can cause extreme temperatures inside the converter. Eventually, these high temps can destroy the specially-coated honeycomb inside. Engines can run rich for dozens of different reasons – broken O2 sensors are a common cause, but they’re not the only possibility. Usually, an engine running rich will give you a “check engine” warning. 3. Fuel contamination. Fuel contamination is pretty uncommon, but it happens often enough to be a significant cause of catalytic converter problems. Ring wear can cause an engine to burn oil, and burnt oil can destroy a catalytic converter pretty quickly. A blown head gasket can cause an engine to burn coolant, and this can also damage a catalytic converter. Since catalytic converters rely upon precious metals to function, they can be very expensive to replace. What’s worse, most people have no idea what a catalytic converter should cost, so repair shops and auto dealerships often charge 50-100% mark-up (!) on replacement converters. Therefore, if you need a replacement catalytic converter, buy it online! You can save hundreds of dollars buying a replacement catalytic converter online, and then your local muffler shop will install it for a nominal fee (typically 1-2 hours of labor to remove old cat and install new one). AutoAnything.com – They sell a lot of different parts and accessories, including catalytic converters. They have both replacement and high-performance catalytic converters available. PartsTrain.com – This might be the best website to buy a replacement catalytic converter on the entire Internet. 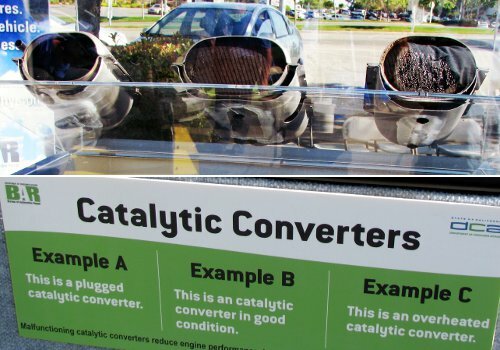 They have catalytic converters for less than $50 (seriously). AdvanceAutoParts.com – Another very inexpensive provider of replacement catalytic converters. NOTE: Before buying a new catalytic converter, make sure you know why the old one failed. There’s no point in buying a new one if it’s just going to fail because there’s a problem with the engine.